Students attending the Yunus Emre Institute's language course in Sultanahmet Square, Istanbul, during a field trip. Learning a foreign language is no easy task as every language has its own rhythm and cadence of words, as well as different grammatical structure. When you are finally able to fully comprehend the grammar there comes another challenge - speaking the language. At this point, understanding the culture where the language was born makes the process considerably easier. Once you get engaged with the fundamentals of the culture, it becomes easier to build up a connection between the words and culture itself. While many experts recommend beginners to live for a while where the language is spoken, there are organizations or institutes that aim to provide this opportunity for people especially for students. The Yunus Emre Institute is one of them and it hosts hundreds of students every year in Turkey, while giving free courses to hundreds of others worldwide, creating activities and programs that aim to blend Turkish culture with the language. "When I first started to learn Turkish it was very difficult to pronounce the vowels in the sentences yet it is not that hard a language for me to learn since my native language is Urdu. I think that there are similarities between these two languages," said Muhammad. She said the reason behind her desire to learn Turkish was her being interested in history from a very young age, Muhammad said: "I actually started to get interested in the Turkish language during my history class because I'm very interested in Ottoman history. I thought in order to learn history, I should start with the language. Last year, I had a chance to find out about the Yunus Emre institute and I signed up for the course right away. They offered me free language classes. Ever since, I've been here." 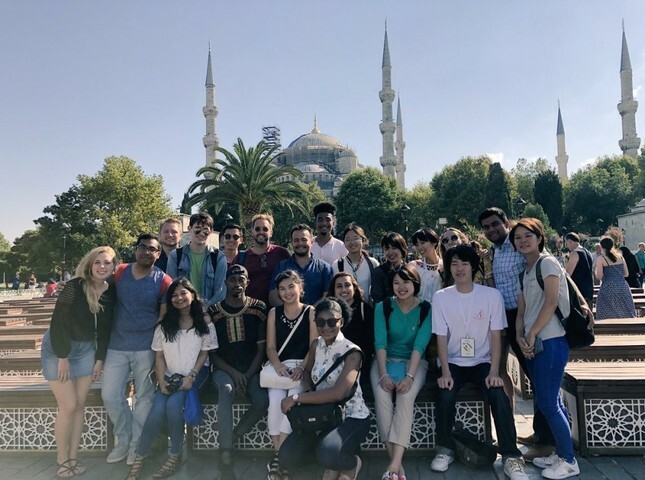 The Yunus Emre Institute, which is a worldwide nonprofit organization launched by the Turkish government in 2007, gives people around the world a chance to learn Turkish while introducing Turkish culture through activities and programs. The Turkish Summer School Program, with the motto "First Turkish, Then Turkey!" is being held for the 9th time this year. The program is one of the many programs that the institute started in order to provide opportunity to students who want to learn Turkish. Within the program which was held between July 16 and August 12 this year, the Institute hosted 1000 international students from 118 countries, in Turkey. Scott Kennedy, who earned his Ph.D. from Ohio State University and will be an Assistant Professor of Humanities at Bilkent University in Ankara expressed his feelings about his time and experience during the course, "I started to learn Turkish because I knew I was coming here for a job. I made some really great friends. It's a lot of fun just getting to talk with them even when speaking very broken Turkish over the first few mouths. Being here has been wonderful in terms of exploring all of the different cultural assets, and learning the vocabulary. Language is a gateway to know people." Just like Kennedy, Paras Khan, a student of the School of Advanced International Studies at John Hopkins University, wants to learn Turkish for academic reasons. Underlining the importance of language while trying to get to know people and countries Khan said: "You have to speak the language if you want to understand people. For example, in Turkish verbs comes at the end which means the people and the items are important. Not what you are doing. That's my comment but I think these details are important. Learning a language really helps you to get to know the minds of people." Learning a new language is surely a path to knowing a different culture and brand new experiences. With this in mind, the Turkish Summer School Program not only consists of just Turkish classes. Within the scope of the one-month long program, students from different countries and backgrounds participate in events related to Turkish culture like a traditional Turkish wedding or henna night while taking various courses such as marbling, pottery, traditional Turkish music instruments or folk dances. Highlighting the importance of experiencing culture though language education Muhammad said, "Being here, grabbing the words people say around me and learning the language through culture, or vice versa, was truly beneficial for me. I have learned more in three weeks in Turkey than I learned in four months in the U.S. My aim is to get better at speaking it, [so] I will keep practicing more and more." While for some, language is a tool to better understand history or culture, for others the history and culture itself is the gateway for learning a new language. Chris Chong from George Mason University said that his being interested in the Turkish language started with a movie "Ayla," a story about a Korean girl and a Turkish soldier who raised her during the Korean War. "My mother worked as an editor for years now. Last year, while my mother was preparing a piece about the Turkish movie 'Ayla,' I had a chance to learn the story behind it. Since than I have been learning Turkish and today I'm here, in Turkey," said Chong.